Bit of a throwback of a pub these days, certainly in this sort of area. Has an Irish flavour but without overdoing the faux Oirish stuff. Good barstaff, quite a locals/regulars place but I'd recommend it. They do bitter as well, unusually for a lot of Irish type pubs, and the Doom Bar I had was perfectly fine. You used to have a lot more pubs like this; genuine. Small friendly little pub. Good service. Had walked past many times, without going in. When I finally did, I found an excellent local that has avoided the refurbishments/rebranding of so many pubs in central London. Bit of an Irish feel: decorated with ephemera from the Emerald Isle. Now regret not popping in years ago. 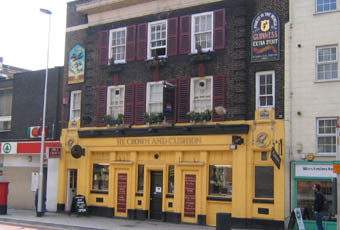 First pub we visited, seems like a 'local' and couldn't believe we were in London as the prices were that reasonable. Beers tried were all good, service good. Good beer . A little out of the way for a pre- train drink , but lots of room. Not so sure about the food . Good value service.